Allow 1 cup butter and the egg whites to stand at room temperature for 30 minutes. Meanwhile, grease and lightly flour three 9x1 1/2-inch round cake pans. In a medium bowl, stir together cake flour, baking powder and salt. Set aside. In a large mixer bowl, beat butter with an electric mixer on medium to high speed for 30 seconds. Add sugar and the 1/2 teaspoon vanilla; beat until well combined. Add egg whites one at a time, beating well after each addition. Alternately add flour mixture and milk to butter mixture, beating on low speed after each addition just until combined. Divide batter among three bowls. Stir melted chocolate pieces and cocoa powder into one bowl. Stir the 1 teaspoon vanilla into the second bowl. Stir 1/3 cup jam and, if you like, 1 or 2 drops red food coloring into the third bowl. Pour each batter into a prepared pan; smooth the tops. Bake in a 350 degrees F oven for 20 to 25 minutes or until a wooden toothpick inserted near centers comes out clean. Cool cake layers in pans on wire racks for 10 minutes. 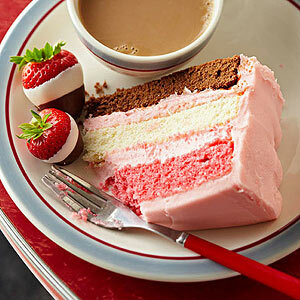 Remove cake layers from pans. Cool thoroughly on racks. Meanwhile, make Strawberry Cream Cheese Frosting and Double-Dipped Strawberries. Strawberry Cream Cheese Frosting: Allow one 8-ounce package cream cheese and 1/2 cup butter to stand at room temperature for 30 minutes. In a large mixing bowl, beat cream cheese, butter, 1 1/2 teaspoons strawberry extract and 2 or 3 drops red food coloring with an electric mixer on medium to high speed until light and fluffy. Gradually add 6 cups powdered sugar, beating until smooth. Stir in 1/4 cup seedless strawberry jam. Makes 3 1/2 cups. Double-Dipped Strawberries: Rinse and dry 12 small strawberries with leaves. In a small microwave-safe bowl, combine 3 ounces chopped vanilla-flavor candy coating (almond bark) and 11/2 teaspoons shortening. Microwave, uncovered, on 100% power (high) for 11/2 to 2 minutes or until melted, stirring every 30 seconds. Dip berries in candy coating, leaving the top third of the berry exposed. Place dipped berries on a baking sheet lined with parchment or wax paper. Chill 15 minutes or until firm. Meanwhile, in a small microwave-safe bowl, combine 1/2 cup semisweet chocolate pieces and 11/2 teaspoons shortening. Microwave, uncovered, on 100% power (high) for 11/2 to 2 minutes or until melted, stirring every 30 seconds. Dip the vanilla-coated strawberries in the chocolate, leaving half the vanilla coating exposed. Return berries to baking sheet. Chill 15 minutes or until firm. Chill, covered, for up to 2 days.